Participants in the AAN Diversity Leadership Program discuss implicit bias—where and how they've observed it in themselves and others—and the AAN efforts to address it. Despite what many would say are decades of progress, disparities in care based on race, ethnicity, gender, and sexual identity remain prevalent in medicine in general and in neurology specifically, according to a paper published in Neurology on February 5 by members of the 2017 AAN Diversity Leadership Program. Among the statistics cited in the review, for example, the authors of the paper noted that black and Hispanic patients were 30 percent and 40 percent, respectively, less likely than white patients to see an outpatient neurologist. And black patients had greater neurology-related emergency department visits, inpatient hospitalizations, and hospitalization costs compared with white people. Moreover, black patients were 70 percent less likely than white patients to undergo epilepsy surgery, and race was a significant determining factor for appropriate intervention for trigeminal neuralgia, even when controlling for insurance and socioeconomic status. “It's very hard to accept the idea that people who are health care professionals, especially within our own field, would provide different care to someone based on race, gender, or sexual identity. That goes against everything that we believe in and the ideals we hold dear as physicians and neurologists,” Jeffrey C. McClean, MD, FAAN, neurology program director at the San Antonio Military Medical Center and assistant professor of neurology with the Uniformed Services University of the Health Sciences. That also doesn't mean that neurologists, or any physicians, are deliberately providing inferior care to members of these groups. Far more often, these disparities are the result of unconscious or implicit bias, which individuals may not even be aware that they harbor from attitudes and systems they've grown up with, as a white person, and/or male, and/or heterosexual, cisgender person; even those from within these groups often hold implicit biases, Dr. McClean told Neurology Today. Indeed, just one week after the article from the AAN Diversity Leadership Group was published in Neurology, an essay in the journal's Humanities Section, “Lucky and the Root Doctor,” was retracted after readers quickly responded on social media and in letters and calls to the author's depiction of an African-American patient and his partner, which they deemed to be negative racial stereotypes. The fact that a neurologist wrote such an essay, and that none of the neurologists who reviewed it for the journal called attention to these characterizations, dramatically illustrates how implicit bias affects even highly educated professionals who have dedicated their careers to caring for the health of others, several neurologists told Neurology Today. Erika Marulanda-Londoño, MD—assistant professor in the vascular neurology division at the University of Miami's Miller School of Medicine, a 2016 participant in the AAN Diversity Leadership Program, and a current member of the AAN Diversity Officers Work Group—recounted for Neurology Today her own early encounter with implicit bias. Dr. Marulanda-Londoño said it occurred in her first year of medical school at Columbia University Vagelos College of Physicians and Surgeons in New York's Washington Heights neighborhood, a primarily Hispanic neighborhood. Discussions about implicit bias can provoke immediately defensive reactions, of the “Are you calling me a racist?” variety, she said. But there's a difference between explicit and implicit bias. “I don't think there are too many physicians who are explicitly racist or explicitly anti-gay, although there certainly are some. But implicit bias is different; these are views developed throughout our life that affect the decisions we make, views shaped by our parents and our upbringing, where we went to school, and the neighborhood we grew up in,” said Dr. Marulanda-Londoño. These biases can be so ingrained into medical culture that even those physicians with a particular interest in diversity can miss them, said José G. Merino, MD, MPhil, FAAN, associate professor of neurology at the University of Maryland in Baltimore and the physician lead for the AAN's Diversity Leadership Program. In another example, he cited a 2013 study in Neurology conducted at Henry Ford Hospital in Detroit—another institution serving an “inner city” population—in which patients with stroke and transient ischemic attack (TIA) who were young and black were reported to be more likely to have urine toxicology screening than other patients. José Posas, MD, a sports neurologist at Ochsner Medical Center in New Orleans, told Neurology Today that participating in the AAN Diversity Leadership program in 2017 has opened his eyes to unconscious bias at his own institution. “Part of the process of correcting this is looking at what we do in our own practice and communities across the country, asking hard questions, and trying to do better. For example, at Ochsner, we have a very good rate-adjusted mortality index [RAM] for stroke,” he said. There are many ways in which these implicit biases may lead physicians to make decisions that lead to the health disparities that have been documented time and time again, said Dr. McClean. Beyond retracting the article, Dr. Gross outlined in his letter to readers a series of steps that the journal has either already taken or will take promptly. These initiatives include implementing changes to the editorial process to mandate diversity review of all articles; recruiting a deputy editor for Equity, Diversity, Inclusion, and Disparities (EDID) and establishing an EDID Table of Contents Category as well as a dedicated topic site. The journal is also working on developing a strategy to increase the diversity of its editorial board and is developing a plan for EDID awareness training, among other ongoing diversity efforts. That's the task of a new AAN group called the Joint Coordinating Council on Equity, Diversity, Inclusion, and Disparities, created by the AAN Board of Directors in September 2018. The group is charged with ensuring that the recommendations from the Diversity Leadership Program, the Gender Disparities Task Force, and the Health Care Disparities Task Force are implemented across the entire organization. In a letter to AAN members on February 21, Academy President Ralph Sacco, MD, MS, FAAN, expressed his own deep regret over the publication of the Neurology Humanities section article. Dr. Sacco described the organization's diversity and inclusion efforts in detail, including training for Academy staff on all aspects of equity, diversity, inclusion, and disparities, as well as opportunities for education on these issues at the upcoming Annual Meeting in Philadelphia. Here at Neurology Today, we have been working hard to ensure that the diversity of our field is being highlighted. In our new print redesign, we even include a full-fledged diversity section with its own icon. I believe that stories about diversity are as important as the cutting edge patient care and science advances that we cover. To date, we have reported on tough issues such as gender disparity in national neurology awards, the gender pay gap in neurology, the lack of diversity among neurology chairs, the challenges of recruiting patients of diverse backgrounds into clinical trials, and many other issues. I strongly believe that the best way to address diversity in neurology is to confront it head on, to write about it, to make sure that we are inclusive in who we ask for commentary in articles, and to ensure that all voices have a chance to be heard. I am proud that two of the three associate editors of Neurology Today are women, as are seven of 16 of the editorial board members. Although our editors come from diverse backgrounds, none are neurologists of color, however, and for that I offer my own apology. I will work over the next few months to further ensure that the editorial board truly reflects the diversity of neurologists. This has been a trying time for all of us. That said, I am confident that we will move forward as a community of neurologists who are even stronger and more united than before. Neurology is a big tent and there is space for everyone to participate and achieve success. •. Marulanda-Londoño ET, Bell MW, Hope OA, et al Reducing neurodisparity: Recommendations of the 2017 AAN Diversity Leadership Program https://n.neurology.org/content/92/6/274.long. Neurology 2019; 92:(6)274–280. •. Silver B, Miller D, Jankowski M, et al Urine toxicology screening in an urban stroke and TIA population https://n.neurology.org/content/80/18/1702. Neurology 2013;80:1702–1709. •. Merino JG. Editorial: Profiling patients https://n.neurology.org/content/80/18/1632. Neurology 2013; 80:1632–1633. 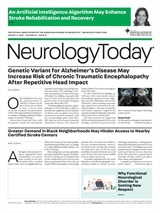 Neurology Today19(7):1,4-5, April 4, 2019.